Marble is a metamorphic rock - a rock formed from variations in the texture and mineralogical composition of pre-existing magmatic or sedimentary rocks in response to different pressure and temperature conditions from the original formational environment. Marble encompasses a vast spectrum of colours with mineral veining generally contrasting to the base stone colour. Some marble tiles may have a meshed backing or resin to help strengthen them when the veins are particularly predominant. Marble is a very dense stone that can easily be polished and is more commonly used to produce tiles. Limestone is a sedimentary rock formed by the accumulation of sediments, seashells and other organic matter and the consolidation thereof following a phenomenon called diagenesis or through the direct chemical precipitation of the minerals of which they are composed. Limestone is also carbonic – formed predominantly of minerals and/or carbonatic lithoid elements such as calcite, dolomite and magnesite. 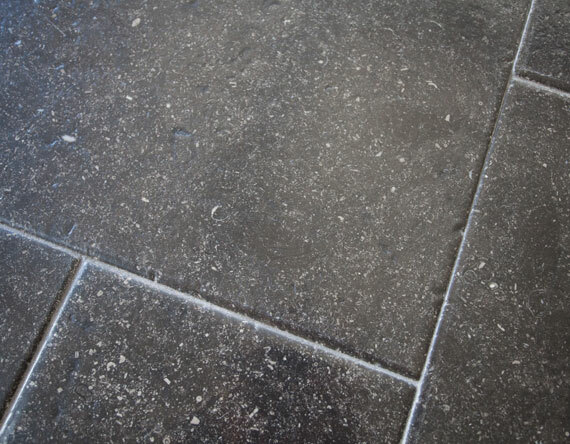 Each limestone exhibits its own characteristic colours and markings, with some limestones having a similar appearance to traditional marbles. Due to their composition, some degree of edge chipping can be expected together with occasional surface pitting, fissures, mineral striations, fossilised shells and resin fill. 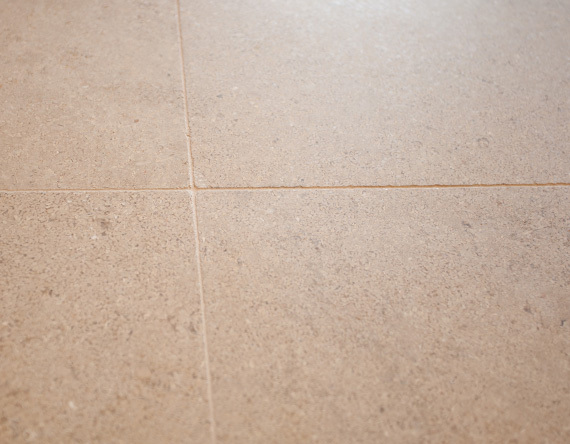 Limestone is generally an acid-sensitive material in addition to generally being more porous than marble, thus care should be taken to seal and clean limestone properly. 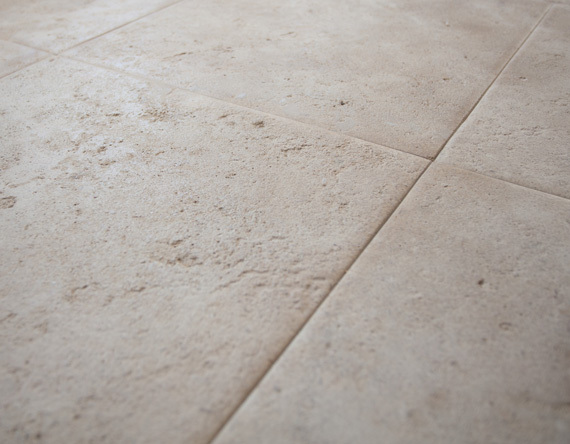 Travertine is a terrestrial sedimentary rock formed by the precipitation of carbonite minerals by mineral springs, particularly hot springs. 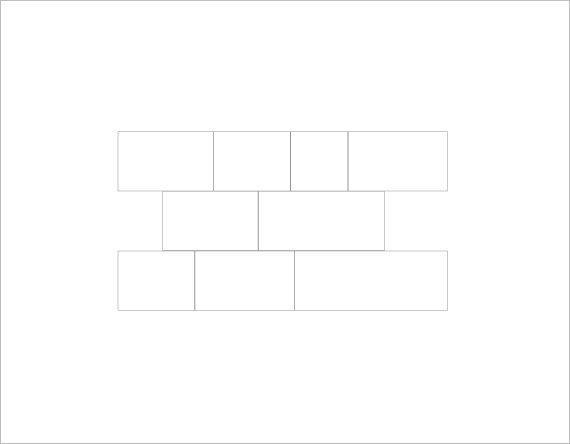 The result of this method of formation is a honey-combed structure which contains visible surface pitting and voids and exists in white, tan and cream colours. 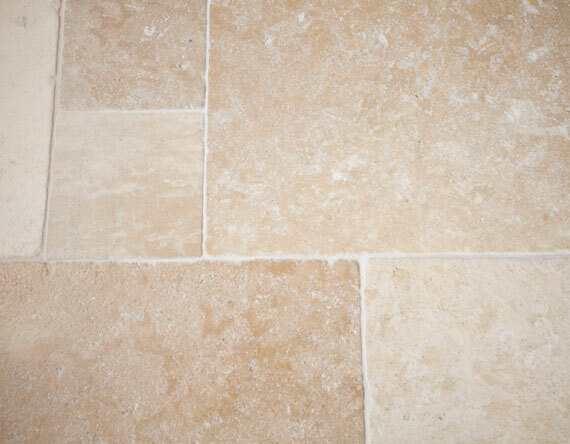 Travertine generally comes in either 'cross cut' or 'vein cut' Vein cut tiles are cut so that the surface plane of the tile runs parallel to the long veins present, cross-cut being cut perpendicular to these veins. Once tiles are cut they are either filled with a colour matched resin, or left unfilled. 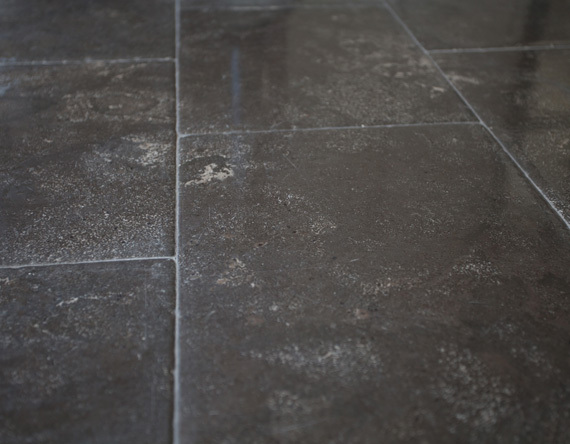 Generally the voids are only left unfilled in tumbled or brushed finishes, where these voids are filled during the grouting process. 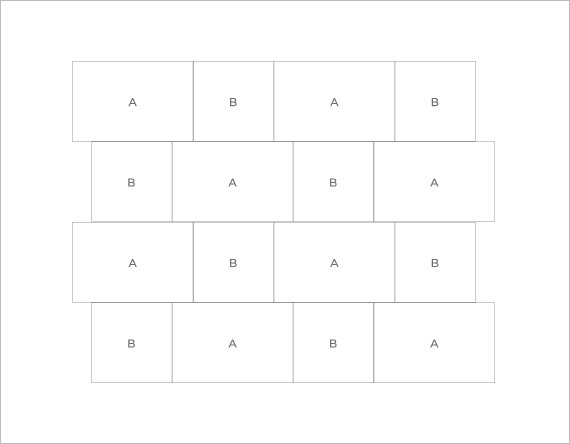 Through general usage over time, some small areas of fill may dislodge or previously unexposed holes may become visible. 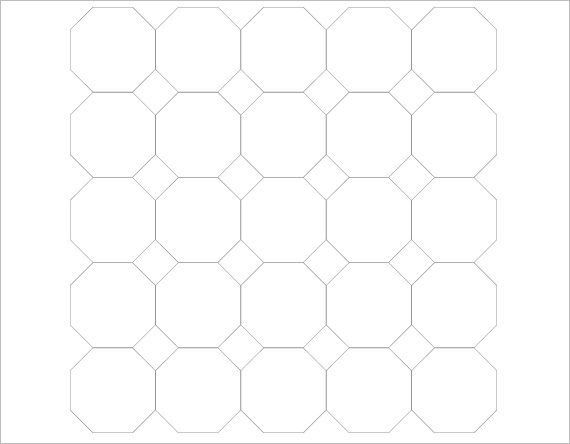 This is not unusual and the holes should be re- filled with a suitable resin or grout. Sandstone is a coarse-grained sedimentary rock formed by compressed sand deposited by water or wind. It is silicatic, being composed primarily of minerals and/or silicatic elements such as feldspars, micas and clayey materials. Sandstone is often supplied in a riven finish which is characterised by its granular, undulating surface, or a silky smooth, honed finish with some variation in texture. Sandstone is hard, but also very porous, requiring thorough impregnation and surface sealing if used internally. 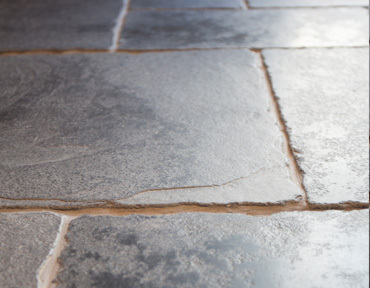 Slate is a fine-grained, durable foliated metamorphic rock characterised by its ability to be split into broad sheets. 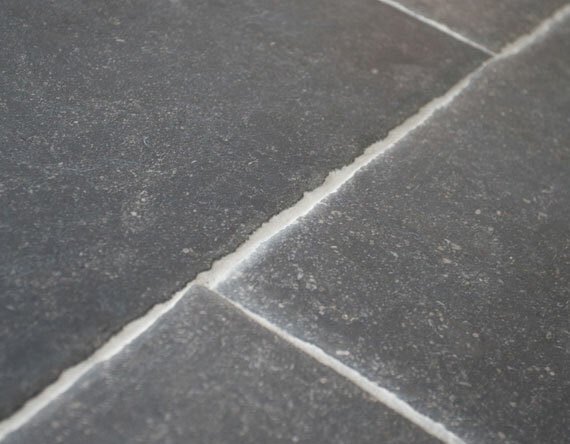 Some slate tiles vary in thickness (or are uncalibrated) and therefore required bedding up with the appropriate thick bed adhesive during installation. These are densely crystalline, metamorphic rocks that offer considerable shade variation, ranging from light cream/white to charcoal grey/black with many colours in between and often contain reflective crystals which glisten in the light. These materials are often supplied in tile formats with an undulating, riven surface finish, as well as highly textured splitface panels. Basalt is a fine grained, dark coloured magmatic rock generally formed from volcanic lava flows where the magma has poured out of the earth's crust and has cooled in a subaerial or subaqueous environment. As a result the magma cooled faster than magma does when it cools under the earth's crust, sometimes resulting in small voids that occur due to trapped volcanic gases. It is a hard-wearing stone that offers some amazing design inspiration. Because of the small voids, basalt should be allowed to dry completely before each stage of the installation process. Granite materials are also magmatic rocks, however, the cooling process of the magma was slower than that of basalt - granite is formed by magma that cooled deep down inside the earth's crust. Granites are amongst the hardest stones available and are commonly produced in polished, honed, flamed or flamed and brushed finishes. Due to the nature of this material and the vast array of mineral crystals that serve to make up this stone, characteristics can vary greatly and some may be acid sensitive, so please ensure that correct sealing and maintenance guidelines are followed. 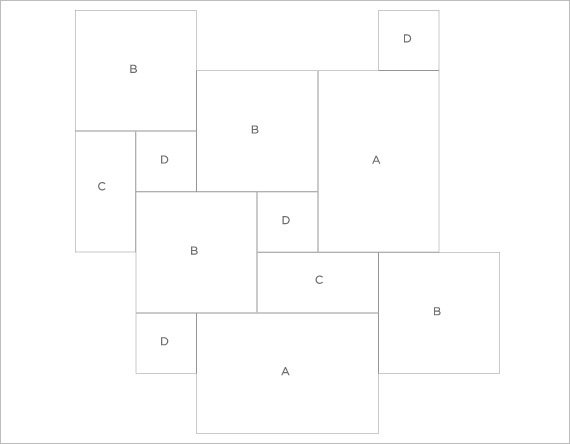 Below is the range of tiling layouts offered by Lasco. 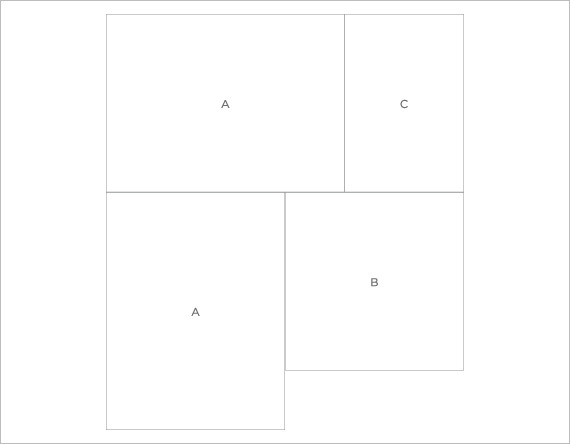 Click on the image to see the overall tiled effect of each layout. To produce stone tiles, massive stone blocks must first be extracted from huge quarry blocks by cutting machines. These blocks are cut into slabs of differing thicknesses by water cooled gang saws. The next steps involve honing, polishing and cutting these slabs into tiles, in addition to any other specialist finishing processes. The geological complexity of stone results in natural variations from block to block within the quarry and also from tile to tile. 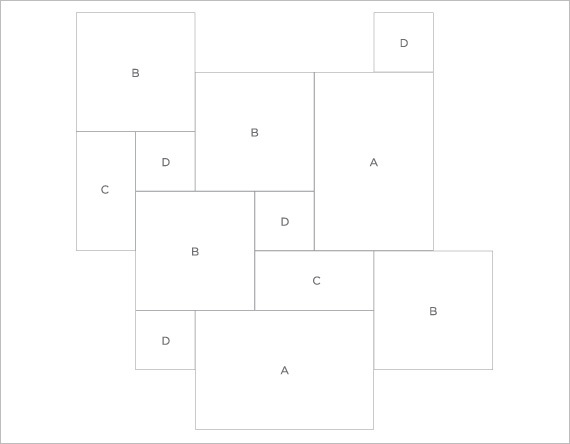 This is why each tile exhibits its own individual characteristics. We work closely with suppliers to select our stone and take great care to show representative displays, images and samples. 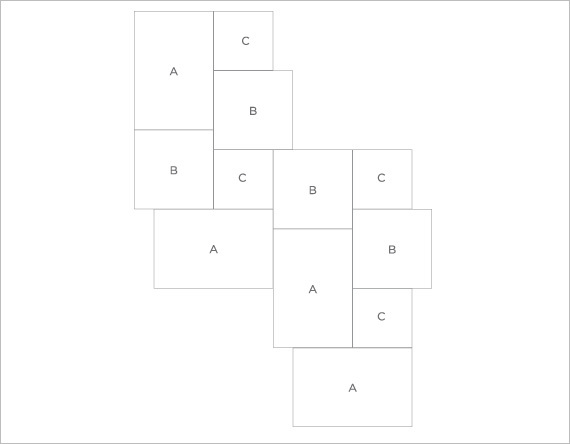 A degree of natural variation is beyond our control and will inevitably occur. This is part of the beauty of natural stone. For this reason we suggest you view as much of the stone as possible before ordering so that you understand the extent of any colour variation or markings the stone typically displays. 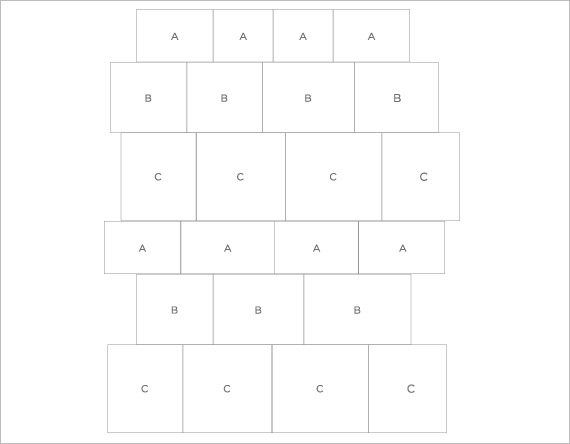 It is possible to have the degree of colour variation limited by asking the producer to keep within a determined colour range. So if we understand your expectations we can work with you to ensure the final result meets your expectations.